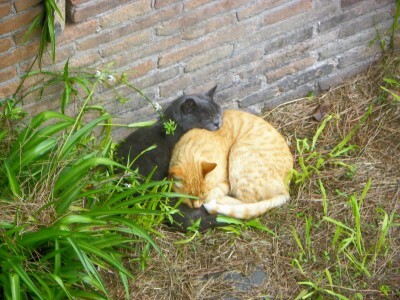 Here are some more kitties from my visit to Rome’s Protestant Cemetery. 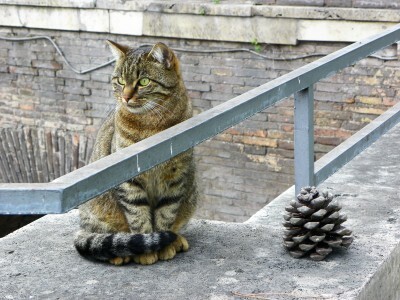 Still life with pine cone. 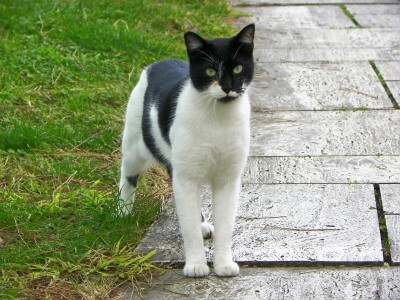 Alert black and white chap. 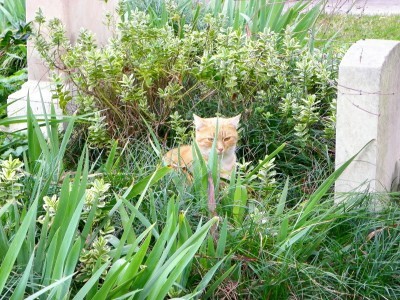 Orange cat contemplates life at Keats’ grave. 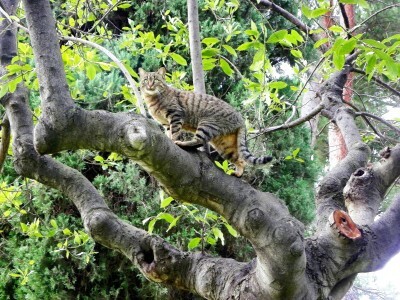 There is a managed colony of stray and feral cats living in Rome’s Protestant Cemetery. I think they like being near the pyramid: reminds them of when they were gods. I have many pics of them, including some here at my Flickr page (if this is not public, forgive me) and here at my National Geographic page (it definitely is public). I’ll start with a few and post more in days to come. 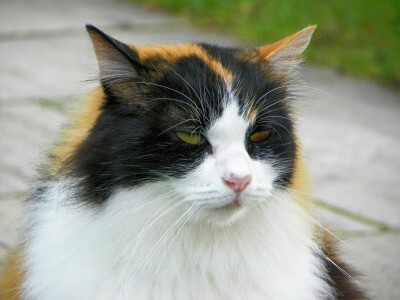 Calico beauty (if you look at my old photos from the links above, you will see that this kitty has been thriving at the cemetery for a few years). 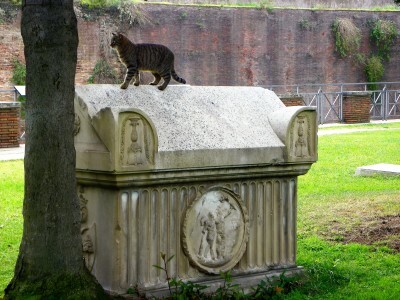 Kitty on a tomb, using it to get up into a tree. Yevgeny Yevtushenko died this weekend. This obituary is fair, I think, describing well both his courage and his limitations. Since most of us only have limitations though, I am less inclined to be critical of his decision to work within the Soviet system. He wrote ‘Babi Yar,’ and for that, we all owe him. I cannot read this poem without tears. As the entire Jewish race itself. I see myself an ancient Israelite. And even now, I bear the marks of nails. It seems to me that Dreyfus is myself. The Philistines betrayed me – and now judge. Squeal, as they stab umbrellas at my face. I see myself a boy in Belostok. And reek of vodka and of onion, half and half. My mother’s being beaten by a clerk. 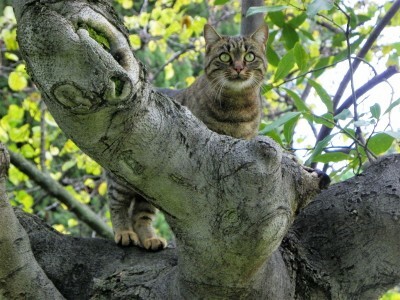 Are international, by inner nature. 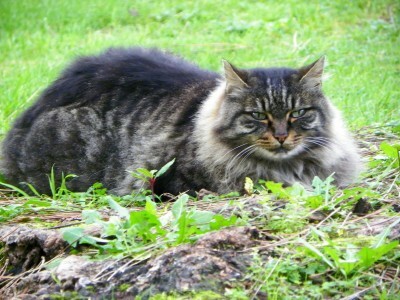 Abused your purest name, in name of hatred. I know the kindness of my native land. But only that we gaze into each other’s eyes. How little one can see, or even sense! In darkened rooms each other to embrace. Of spring itself. She’s coming soon. The trees look sternly, as if passing judgement. I feel my hair changing shade to gray. As I am every child murdered here. No fiber of my body will forget this. The last of antisemites on this earth. Am I by antisemites like a Jew. And that is why I call myself a Russian! More information about the massacre here.